Arguably one of the biggest races of the year will be settled off the track. Eclipse Awards voters still have much to handicap as they consider their choice for Horse of the Year, most likely between Triple Crown winner Justify and Accelerate, the top older horse who capped his campaign by winning the Breeders’ Cup Classic. The last time we had such a debate on our hands, die-hard California Chrome fans dealt with the reality that rising star Arrogate -- the 2016 Breeders’ Cup Classic winner -- had a strong case for the year-end honors. That decision followed American Pharoah’s run in 2015, when it seemed as though no horse, no matter the resume, could beat out a Triple Crown winner for Horse of the Year. This, however, is a different story, with the discourse ramping up as soon as Accelerate hit the wire Nov. 3 at Churchill Downs. “It’s called Horse of the Year for a reason,” his backers insist. But isn’t a Triple Crown sweep always Horse of the Year-worthy? Sides are taken, unless, of course, you like the 3-year-old filly Monomoy Girl, who had a dazzling season in her own right. However, her lack of facing open company will all but prevent a Horse of the Year nod. Pro: Only once in history has a Triple Crown winner not received the Horse of the Year title, and that came in 1935, when warhorse Discovery, who won 11 out of 19 races that year, beat out Omaha, who ran third to Discovery after a Triple Crown-winning campaign. Eleven other times, the Triple Crown winner has been named Horse of the Year. Con: Hardly any other Triple Crown winner has stopped running after their 3-year old season, however. Justify won all six of his starts but never had the chance to take on older horses as American Pharoah did. Pro: Justify is the only horse to have not run at age 2 but still managed to sweep the Triple Crown. Of course, in terms of the Kentucky Derby, he was the first to take it without competing as a juvenile since Apollo in 1882. Con: It’s worth questioning the talent level of the crop Justify faced. Only Derby runner-up Good Magic and Promises Fulfilled, who emerged from the race a sprinter, have gone on to win Grade 1 races the rest of the season. Pro: Justify is the only Triple Crown winner to end his career undefeated. Four of his six wins came in Grade 1 events, while the other two were sound beatings in maiden special weight and allowance optional claiming company. All of it was accomplished from February through June. 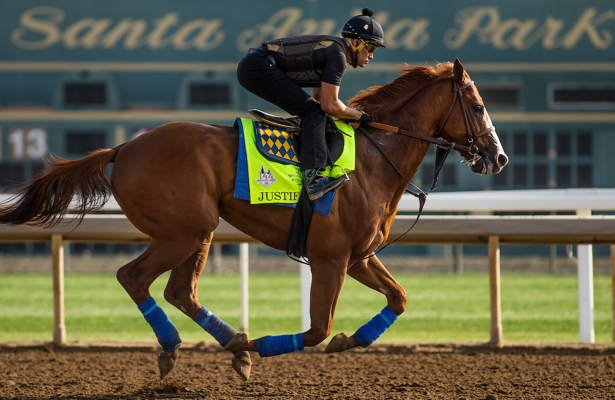 Pro: The weakness in Justify’s case for Horse of the Year is highlighted by Accelerate’s strength. He raced seven times against horses of all ages during a campaign that ranged from February’s San Pasqual (G2) to the Breeders’ Cup. Con: Accelerate did lose, dropping the Oaklawn Handicap (G2) back in April to City of Light. There were silver linings in the defeat, as it came to another eventual Breeders’ Cup winner, and at nine furlongs, shorter than Accelerate’s best distance. Pro: Following that defeat, Accelerate won out, becoming the first horse to sweep the Santa Anita Handicap, Gold Cup and Pacific Classic (along with the Big ‘Cap run in March) in the same season. Con: Simply, Accelerate didn’t achieve anything as singularly historic as the Triple Crown. While the son of Lookin at Lucky did win more Grade 1 races than Justify, none of them put him in the same category as horses like Secretariat, Seattle Slew and American Pharoah. Pro: If it comes down to “what have you done for me lately?” Accelerate could gain an edge. In the Breeders’ Cup Classic alone, he beat more Grade 1 winners than Justify did in his career. Plus, Accelerate is running on, aiming toward the Pegasus World Cup as a career finale. The way Accelerate wins Horse of the Year is if voters decide that Justify’s 111-day campaign was not long enough to consider him the year’s best horse, or that he did not face strong enough competition. On the other side, Justify runs away with the award if voters focus on the fact that he is history’s 13th Triple Crown winner, and racing’s first Triple Crown winner to retire undefeated. There are certainly ways that either horse could end up on top of the Horse of the Year race, and the conversation will continue through Jan. 24, 2019, when the Eclipse Award winners are announced. An avid racing fan since age 10, when she first saw the movie "Secretariat," Jackson has been passionate about diving deeper into the sport, whether that be by going to various racetracks or developing contacts with those in the racing industry. She began writing about racing in seventh grade, when a 500-word writing assignment turned into a published book. But her proudest writing accomplishment came in 2015, on a Facebook comment about the racehorse Runhappy, which earned her two tickets to the 2015 Breeders' Cup and the opportunity to hoist the Breeders' Cup Sprint garland over her shoulders. Jackson lives in Northeast Indiana, where she keeps a variety of animals, including her two off-track Thoroughbreds, Rayonnant and Swinging Chango, her mini horse and her Paint. 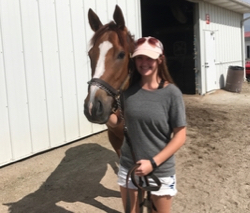 In the fall of 2018, she began attending the University of Louisville, where she's majoring in Equine Business Management.